Removes hat and peers into the distance. Will fall over and come apart shortly after being summoned outside of the Winter Veil holiday. Emote /wave while targeting and it will wave back. Emote /dance and it will dance with them. Emote /kiss and its hat will flip in surprise. This is one of four BoU Winter Veil pets that drops at random from the [Gaily Wrapped Present]. You must be level 20+ to loot this item. This item appears under the Winter Veil tree in Ironforge (alliance) or Orgrimmar (horde) on and after December 25th through January 1st, but the [Snowman Kit] can often be found at auction year-round. Unlike other small pets, Tiny Snowman is immobile and will not follow you. However if you perform certain emotes with him, such as '/dance' and '/kiss', he'll respond with different animations. 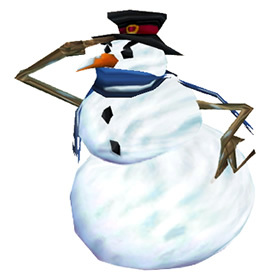 As of patch 4.3, the Tiny Snowman no longer requires a snowball to summon. It will not remain summoned for a long period of time outside of the Winter Veil holiday, and will fall over and disassemble during the off-season. During the Feast of Winter Veil, this companion will be significantly larger and will not topple over a few moments after being summoned. Throws his hat at the enemy, dealing 394 Magic damage. for some reason, this is the only elemental pet with blizzard, making it great against mech, well, if it wasn't for the terrible breed. Commits Seppuku if you summon him out of season. Happy birthday, indeed. I was surprised to see him out and about in my Lunarfall Garrison and decided to follow him, resulting in a fun surprise. He scooches along the main path and stops at the town hall, the little house near the druid cave, the Inn, and the tower beyond the mine. He tips his hat at each stop! This is the best screenshot I got as he does it rather quickly, and my bodyguard kept getting in the way. I had to summon him twice to battle-stone him. The second time I had my bag open and ready and hit him quick before he keeled over. How the heck do you use a battle-stone on him? In case anyone else may be wondering, as I was, this pet can battle outside of the Winterveil holiday (he falls over dead if you just summon him to hang out when it isn't Winterveil). I wonder how tiny snowman will stand up to the fire storm of a fire bug... gotta level him quickly and find out...before he melts away. He's a cute little fella, although stationary. He waves back, dances with you, and my favorite, gets shy and a bit embarrassed at being kissed. His hat spins right off the top of his head! What a funny little snowman! The range on the /dance, /wave and /kiss emotes are quite far. So even if he's unable to follow you, he's still got you in mind! BUT your best bet is to loot presents on alts too! as the pets are not BoP! 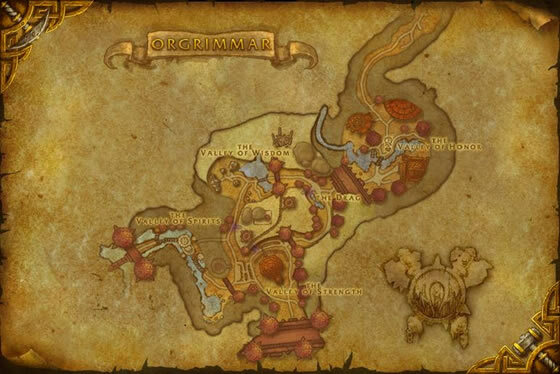 so once a day, starting Dec. 25th (to Jan. 2nd), loot presents under the tree in Org(? 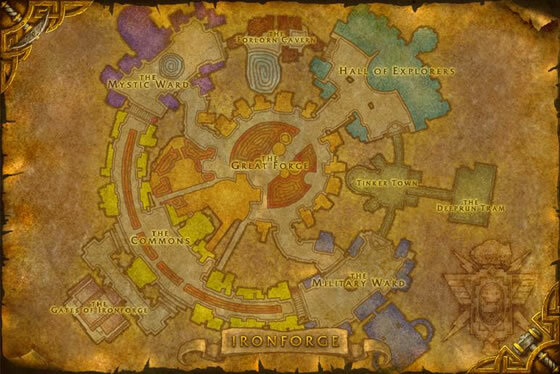 ), on as many alts as possible (think they have to be level 20+). :) Good luck! My best advice for a way to "farm" this pet, as well as the other Winter's Veil pets, is to level a whole bunch of alts to lv20+. This in itself shouldn't take long, and it guarantees more chances at actually getting the pets for free, and not having to pay for them. Also, if you do buy them, try to do it when there's an abundance on the AH. Come July-August, these pets can fetch as much as 10k+, depending on your server. This thing needs to be able to move! maybe he could hop after you? or maybe slide around like the Snowman from the Rudolph movie? Of all the non-combat pets Ive seen this one stands out. This is the only non-combat pet that I know of that stays still. This pet will not waddle along behind you like most pets. It also does some little dances and hat tips making it a interesting pet but its inibility to move and the regent cost makes it a pet that will be rarely summoned. Let me tell you about the Tiny Snowman. This pet has a mind of its own! You may tell it to go somewhere, but it steadfastly refuses to obey your frivolous whims. The petty urgencies of its owner mean little to it, and it is content to stand in the sun, melting until it dies. Truly it should be commended for its stubbornness and single mind while the rest of the pets blindly follow their owners into death and danger and loading screens!